IF YOU haven’t already started, now is the time to start storing away your plastic shopping bags. From 1 July, free single use plastic bags will be banned virtually nationwide, with major retailers Coles and Woolworths also adding NSW to the list despite the Government there saying they can remain in place. But if you’re living in one of 16 suburbs across four states, the plastic prohibition will come much earlier — as soon as Wednesday and almost three months ahead of schedule. From the ritzy Melbourne enclave of Toorak to the tropical town of Mossman in far north Queensland, select supermarkets are testing the waters prior to July to gauge how being denied plastic bags will go down with shoppers. A Woolies spokesman said the pre-emptive move was designed to “monitor the feedback from customers” prior to the full plastic axe on 1 July. South Australia was the first state to phase the bags out back in 2009. It slapped retailers with fines of up to $5000 for distributing banned bags and retailer suppliers could be fined up to $20,000. ACT and the Northern Territory followed suit in 2011, while Tasmania banned them in 2013. Queensland, Victoria and Western Australia will ban them from July this year. Last year, Woolworths announced that not only would it be abiding by the ban in those states, it would also withdraw the bags in NSW. It’s understood that with the other states on board with a ban, it was easier to simply withdraw the bags in all stores. Hours after Woolworths made its announcement, Coles matched the pledge.A Woolworths spokesman said of the early bans in 12 stores: “Our teams have been hard at work reminding local customers about the upcoming change in recent weeks, and the feedback from the community has been really positive so far. From Wednesday, 4 April, free plastic bags will no longer be available from stores in Toorak, Wyndham Vale and Taylors Lakes in Victoria. Sydney stores in Marayong, Greenway Village and Dural, and the NSW regional town of Mullumbimby, will also say an early goodbye to the bags. In Queensland, plastic bags will be gone in Mossman and Noosa Civic and in Western Australia the stores will be in Singleton, South Fremantle and Cottesloe. Coles also confirmed to news.com.au that it was removing bags in some stores. Balgowlah in Sydney, Williamstown in Melbourne, Inglewood in Perth and Hope Island in Queensland will lose their plastic bags two months early on 30 April. 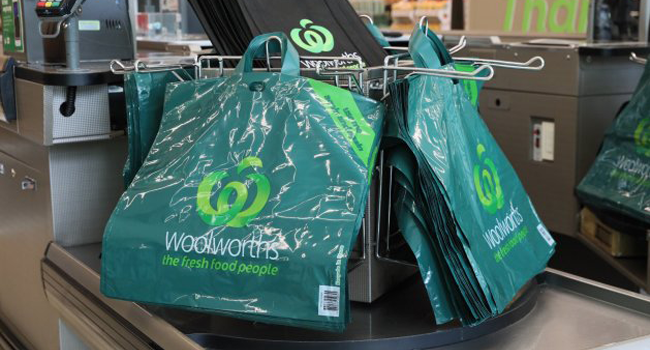 “We know many customers enjoy the convenience of single-use bags, so we’re trialling the phase out in a number of stores to ensure we make the transition as easy as possible,” said Coles Managing Director John Durkan.